Bone density (also called DEXA or bone densitometry) utilizes low-dose x-ray technology in order to measure bone mineral density. A bone density test uses X-rays to measure how many grams of calcium and other bone minerals are packed into any segment of bone. It is most often performed on the lower spine and hips and is used to diagnose osteoporosis and other conditions that cause bone loss. 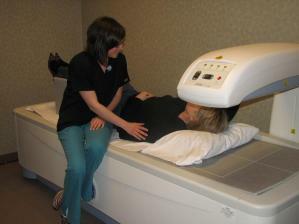 Bone Density tests are quick and painless exams, as virtually no preparation is needed. The procedure generally takes about 10 minutes to complete. The technologist will position the patient on a padded table. The patient must hold very still and may be asked to keep from breathing for a few seconds while the x-ray is taken. Wear loose-fitting clothing that does not have metal zippers, belts or buttons. You may even be asked to wear a gown during the exam. Otherwise there is no preparation for this exam.